• Accommodation: Two options of hotels are offered and you chose depending on your budget. After breakfast transfer to Mangapwani village. Visit of the slave caves and chambers. Lunch at Mangapwani Serena Restaurant. The restaurant is located on the outskirts of Zanzibar stone town. The Serena Mangapwani Restaurant and Water sports Centre is a great destination for those looking for somewhere special. Visitors to Mangapwani are offered a fresh seafood barbeque cooked to perfection by Serena’s expert team of chefs. The atmosphere is informal and friendly and the restaurant comprises a series of traditional makuti bandas, all set into a lush hillside overlooking an idyllic beach. At additional costs guests can also enjoy fishing, snorkeling, kayaking, catamaran rides and other pleasant distractions at the well-equipped watersports centre. Late in the afternoon, drive back to stone town. Overnight at the hotel in Stone town. Zanzibar is the romantic gateway to Africa. 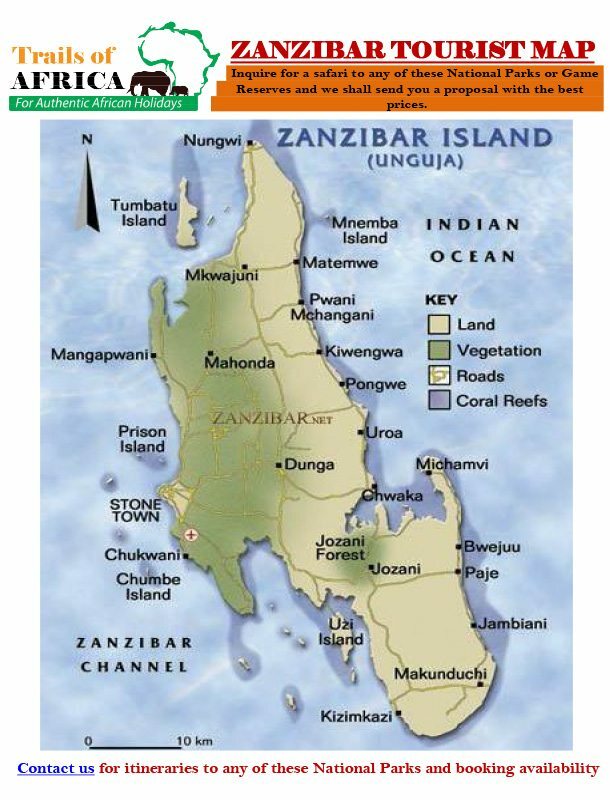 For generations the name Zanzibar has captured the imagination of people as a far away, exotic and legendary island located in the Indian Ocean near the East African coast. The island has been a home to Persians, Arabs, Indians and Portuguese traders. Spices and slave trading made the island rich and famous. The east of the island is the location for the famous palm-lined beaches and beautiful coral lagoons with fascinating and marine life and local culture, whilst the west has some wonderful soft-sand beaches which are ideal for swimming. In Pemba the beaches are all about total isolation, with thousands of small coves that you can bring a boat into and have to yourself. • Dolphin Tour:– Visit the fishing village of kizimkazi. It is here that we find the first evidence of Islam in East Africa. Visit the old mosque built in 1804 and board a local dhow or boat to see the dolphins and swim with the dolphins. Zanzibar is the romantic gateway to East Africa. The east of the island is the location for the famous palm-lined beaches and beautiful coral lagoons with fascinating and marine life and local culture, whilst the west has some wonderful soft-sand beaches which are ideal for swimming. In Pemba the beaches are all about total isolation, with thousands of small coves that you can bring a boat into and have to yourself. The island has been a home to Persians, Arabs, Indians and Portuguese traders. Spices and slave trading made the island rich and famous. See the wonders of Stone Town. The tour starts at the City market where you can sample the local fruits and spices. We then continue to the magnificent Sultans Palace full of artifacts and historical objects, The Arab Fort and walk through the meandering narrow streets of Stone Town. On this tour one gets a chance to visit Dr. Livingstone’s house, the house of wonders and the Zanzibar museum, which holds many interesting relics from the past etc. Zanzibar is known as being a spice island. Tour begins with a visit to the Persian baths built in 1850 by Seyyid bin Sultan. Then proceed on to the spice plantations at Kizimbani. Spices to be seen here include, cardamon, cinnamon, cloves, black pepper, nutmeg and tropical fruits like the jack fruit, bread fruit, pineapples and other rare plants like the lipstick tree and henna bush. There is ample oppotunity to purchase packaged spices, essential oils and trinkets at the local stall. The forest is home to the rare red colobus monkeys found only in Zanzibar. This tour also includes a nature trail through the forest seeing different kinds of animal and bird species. We can combine this tour with either the spice or city tours.. This is a full day tour to the north coast of Zanzibar to the dhow building village in Nungui. One gets a rare chance to meet the local craftsmen as they work on the small and large dhows. This half-day tour involves a visit to the fishing village of kizimkazi. It is here that we find the first evidence of Islam in east Africa. Apart from having a chance to visit the old mosque built in 1804, we also board a local dhow or boat to see the dolphins. One can try to swim with the dolphins and if lucky, even touch them. The tour also includes snorkeling. We however give no guarantees of seeing the dolphins.